There is possibly not a topic in business that is more written about than 'strategy'; except perhaps 'leadership. In my view, all projects are a response to a strategic need: they build capability for mission delivery into the future. Some concepts of strategy have a static feel to them: Porter's 5 forces, for example. I know Porter's model is not static, but it tends to a static iconography. 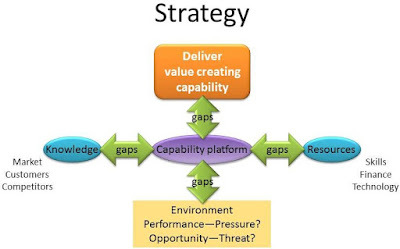 The 'capability platform' is created by capital investment, responsive organisation structures and processes, and the right people to deliver skills that make strategic sense in the business environment.